I haven't gotten around to some emails and Twitter questions over the past week. So I figured I'd put together a couple of mailbags. So if you have any questions about golf in San Francisco or anything else, send em in here or on Twitter. Hickorys hickorys and more hickorys. Will we see these come back in style? Will golfers start frowning upon technology like performance enhancing drugs and consider it cheating? This week I had my first hickory experience, and I am hooked. I only had a driver, and I used modern golf balls, but I found it far more interesting to play golf. The hickory driver reinfused strategy and skill back into the game. On Thursday, I played exclusively with the hickory driver at Northwood and Meadow Club. It was the most fun I have had on a golf course in a long time. In particular, at the Meadow Club, the effect of reduced distance off the tee was exhilarating. I am a relatively long hitter. When I am swinging it well, I hit it around 300 yards. It makes the vast majority of golf courses a driver-wedge fest. To me, this is a dull golf experience. Why carry 14 clubs around if most courses only force you to use 7-10 in a round? The 6th hole at Meadow Club exemplified the difference that a hickory driver made in the strategy of a golf course. The 6th measures 454 yards and has a creek that runs down the right side. The creek divides the 16th and 6th fairways. The 6th is reminiscent of a typical PGA Tour setup trees line the left side, and the creek runs the right. It gives you a clear direction - hit it straight and far. A good tee shot with today's driver will leave me with somewhere between a wedge or 8-iron approach into the green. The green is spectacular. It slopes severely front to back and has huge bunkers on either side. The angle doesn't matter to pins on either side because you are approaching with a high-spinning shot. I'm not a Tour player but for this exercise let's use their data, Jordan Spieth was best from 150-175 yards last year averaging 22'5". The worst was Hunter Mahan at 33'10". From this distance, it's a pretty safe bet that a PGA Tour pro will make a birdie or par and that a good amateur will likely make a par. With a hickory driver and Pro V1 golf ball, I was hitting drives between 240-270 yards. The margin of error is much smaller, but the reduced distance also leads to misses going less off the line. I stood on the 6th tee and faced a conundrum. The tucked left pin presented a problem. Playing down the center of the 6th fairway would leave me a poor angle to attack the flag with a mid to long iron. MacKenzie provided an alternative route, playing down the 16th fairway. It brought the creek into play and made the hole longer, but it gave me an angle to get to the flag with a long-iron. I played to the right, leaving myself 205 yards into the green that is perched on a knoll. From here, I hit a 4-iron into this divisive green. Again using the PGA Tour proximity stats, Alex Cejka led the Tour averaging 32'8," and Carl Petterson brought up the rear at 51'. This distance makes bogey or worse in play. It makes the greenside bunkering menacing again. It brings challenge and strategy back to the golf course. There are dozens of examples that I could throw out just like the 6th at Meadow. Besides the strategic enhancement, a hickory driver provided, my other big takeaway was how much better of an overall test it was. At Meadow Club I hit every club in my bag, par 5's required three good shots or two outstanding shots to have a birdie opportunity. It brought back the greatest test in golf, the ability to approach greens with long-irons. More so than ever I believe that professional golf and high-level amateur golf needs a roll back. A game with shorter drives requires more skill and thought and as @leftymjs said golf is in a similar place today to baseball's steroid era. Watching 400-yard drives isn't exciting. Strategy, heroic shots and recovery are exciting. The 6th still has some work left to get back to its original self, here's a look at what the hole could look like and the great strategy. With the trees removed along the left side of the fairway, it would allow for players to play down the 13th fairway to gain an angle to the right flags. I am certain that this work will get done shortly with Mike DeVries and Sean Tully working on this splendid golf course. What a fully restored version of Meadow Club's 6th could look like. Did Northwood make you rethink your stance on trees? The giant redwoods, thick fog layer and ambiance made an early morning round at Northwood a spiritual experience. It was an amazing golf experience that wouldn't have been the same without the trees. A point that Zac Blair made was that the scale of the trees made the course appear narrower. These trees were so big that the golf course and semi trucks looked minuscule. I played Northwood with the hickory driver, it made the short 2893 yard nine holes interesting. Northwood has lost the majority of its original bunkers (which are grassed over), so the trees take a leading role in the strategy of the golf course. If a proper restoration were ever done, some trees would have to come down to allow for strategy. Agronomically, the trees a terrible for Northwood, they let very little sunlight in. Grass needs the sun to grow; the course is currently taking down trees to on some holes to help promote grass growth. I will expand greatly on Northwood, but for 99% of courses, trees that aren't indigenous are bad. neck pillow for flying. Over or under rated? Extremely overrated, I don't understand how it works. I prefer the balled up hoodie against the window. One product that has always intrigued me is the HoodiePillow. Lake Merced looked beautiful when the LPGA played there. Is it in an underrated gem of SF golf? Lake Merced is a wonderful club with rich golf history. 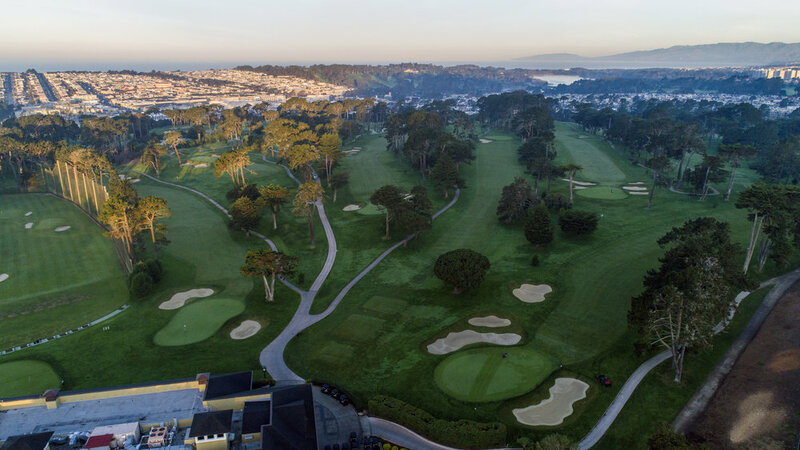 The course is in the heart of San Francisco and within shouting distance of SFGC, the Olympic Club and TPC Harding Park. The course is kept in superb condition by Superintendent Matt Dachowski and has a wonderful property for golf. The golf course is quite enjoyable and an excellent place to play golf. Knowing its history makes you think about what it could be. A few years after opening in 1922 the course got a facelift from the great Alister MacKenzie. The course stood as one of the finest courses in California and the country until the 1960s when the state needed to expand Interstate 280. Lake Merced lost some of its lands and the course got redone by Robert Muir Graves, who took a heavy hand to the remaining MacKenzie work. LMGC then underwent another redesign in 1996 from Rees Jones. To solve agronomic issues, Rees raised greens, installed deep bunkers and added a load of artificial mounding to the property. All of this takes away from the lands natural beauty and makes the course less playable for the everyday golfer. 1996 was just before the restoration wave swept through golf, its too bad because Lake Merced has the potential to be a phenomenal course. It would be great to see the membership embark on a true restoration as close as possible to the MacKenzie version of the course. Did you get a pair of FJs? If you aren't on Twitter, my choice of shoes this week caused quite an uproar. I am the type of person that buys one pair of golf shoes and beats them into the ground. My Air Westy's were at an unwearable point, so I decided to head on this excursion with my running shoes instead. I have found that golf shoes don't matter for me, I never really slip. I forgot the great value that golf shoes provide on early morning rounds, preventing water from flooding your feet. The round at Northwood was a shoe ruiner. Despite being left outside to air dry for three days, the shoes were still soaked when I headed home. It led me to purchase a pair of golf shoes at the Meadow Club that most people mistake for boat shoes. They are made by Canoos, I was pretty happy with them but don't think I will be rocking them with shorts anytime soon. I will likely do some hunting online soon and find a new pair of shoes to run into the ground. If you had a bag of balls and could just hang for a few hours hitting shots into one green on your SF tour, what would it be? There were quite a few spectacular green complexes. One that sticks out to me is the 2nd hole at Pasatiempo. It's a long par four that is one of the more underrated holes in golf. The green is fantastic, and Zac Blair, Jay Blasi and I spent about 10 minutes hitting shots into its different portions. It has a deep fronting bunker that guards the bowl like portion of the green. That bowl can be reached using a low running shot off the kicker slope just short of the green. The small back tier is elevated and by far the most difficult to get to. This green is amazing because it provides alternative routes to its different spots. It gives both high and low trajectory players a chance. It's that time of year where all the new equipment is coming out. If you are someone like me, what do you look for if replacing any equipment? What are some tips you look for? Also, would you rather go through lessons or be fit for new clubs? I'm not a big equipment guy, I typically go to a club fitter and try out a few options and see what performs the best. Clubs is an extremely personal purchase. What works for your friend or Rory McIlroy isn't necessarily the best thing for you. It's one of the reasons that I stay away from equipment reviews; every club is different for each golfer. My best advice is to go into a club fitter with an open mind and try out different equipment. I have a story about clubs from last year. I have been getting fit at Club Champion in Chicago since it was an operation run out of a garage. It's on the high-end of a price, but they do a great job, and I rarely switch clubs, the piece of mind is worth it to me. I went in to get a new Epic last year and the guy I get fittings from told me not to do it. I had picked up a small amount of ball speed, but my dispersion was far greater than with my old driver. Making a change would mean a couple of yards but far fewer fairways. I didn't buy the driver. I believe that the consultative approach is worth the money. Which leads me to golf equipment is beyond overrated. Good clubs are important, but year to year the difference is miniscule. What makes a big difference is swinging the club properly. I have gone to the same instructor, Kiel Alderink, for almost a decade. I think continuity with an instructor is vastly underrated. I would liken it to a masterplan in architecture. Over the last eight years, Kiel has transformed my golf swing and gotten me playing the best and most consistent golf of my life, despite little to no practice. I would encourage every golfer to find a good instructor and spend their money on them rather than the latest equipment fad. Whole bean and grind yourself or preground coffee? I am a closet coffee connoisseur; I have been brewing my cold brew for about five years. I use this Coffee Sock system that I picked up in Austin. You gotta go full bean then grinder. When are the hats hitting the shelves?! And what happened to the towels?! Look for part II of the mailbag on Thursday and if you have a question send it in here.